This past week has been a goofy week. Next week should be back to normal for sure. We are almost half way through Issue #5, guys! Also, Issue 5 is the last Issue for Captain John Andre. I have put him in under Former Cast but he's still on the list. I have put Evil Howe & the Headless Horseman under Featuring Cast. I have made Pvt. John Phillips Captain John Phillips. And I add "Sir Billy" next to Major General William Howe. In the near future, I will drop the "Major" from Howe and Clinton and I will add "Major" on John Andre later on in ACT IV & V. And there is only 2 Issues left of ACT I. Issues 6 & 7 will have the same style as Issue 0. ACTS II & III Issues will also have the same style as Issue 0's. Lucky that Sleepy Hollow webcomic won't be on hiatus for June. I will recap all of the Issues we've finish so far . . . It all start with Brittney and the kids to get ready to start off the story. The kids wants to hear the story and Mike is picking on the girls. Michelle and her brother Jake are glad that they are related to General Howe. The story is being told about General Howe and he first appeared in and it only takes only 4 pages for him to appear in. (Most normally the main character shows up in the first or second page but General William Howe appeared in the 4th page.) Mike won't keep his mouth shut. The story is picking up and General Howe reappears. General Howe thinks about his brother George's death. (It's hard for him to lose a brother.) Then he thinks about James Wolfe. And he changes his mind so that he will be fighting in the war. General Howe sets out to Boston. Pages 11-14 are extra pages that were added after page 10. General Howe is on his way to Boston and Clinton first appeared in the first page. Howe starts having dreams about the headless horseman. Then, Howe is about to tell Clinton about the dreams he as been having or just got them. And the captain thinks that Howe is just having a bad dream and Clinton, on the other hand, thinks Howe is still thinking about his brother George's death. They also made it to Boston safe and sound. General Howe thinks about the city and he and Tom Phillips first met each other and Howe tells him about the dreams. Howe thinks about the dream and he thinks he needs a rest. Howe eats with John Andre. 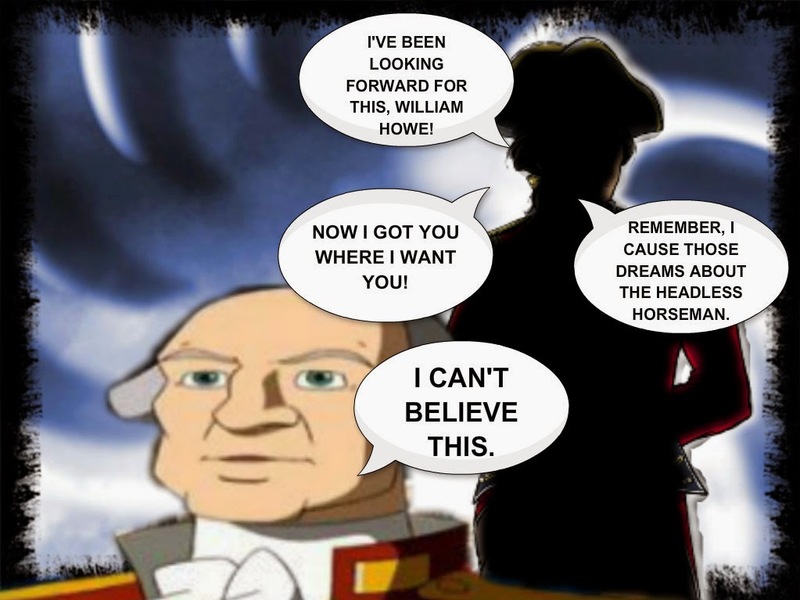 Andre tells Howe that he should meet John Hampton and the horseman reappears. Andre also asked Howe if he is alright and Howe says he is fine. Howe told Andre about dream and he got the news that 3 women were killed and their heads are missing. Issue 2 picks up where Issue 1 left off. And one of the spies hands him the paper. He thinks that the headless horseman is behind it all. Howe also tells one of his officers about the dream. The horseman reappears again. Howe is having that dream again. He get's ready to tell Clinton about the dream. He tells Clinton about the dreams but Clinton think Howe should talk to a family member about the dreams and Clinton never cares about the dreams. Clinton also tells William to write a letter. Howe also tells him that the horseman is real. He and Clinton fights on about the dreams and the headless horseman. Clinton tells him to take a rest by ordering him to do so. And Howe keeps talking about it and Clinton tells him to shut it. More info on the 3 women were in their 20s when they were killed. Clinton kind of believe him on that part on the women being murdered by the unknown killer that cuts people's heads off. Clinton makes sure that Howe get's some rest. William Howe disobeyed Clinton's orders by shopping for some flowers. Then, Howe tells Andre about Clinton and the dreams. Capt. Andre offer Howe some wine and said no and only want some tea. Then again, John A. ask him if he is alright. Howe said he'll be fine. Howe heads off to bed. Howe looks at the facts and the horseman appears again. Somebody is calling his name. Howe ask who's calling him and called his name again and again. The dark figure shadow appeared, which that is Evil Howe as the dark figured man. The dark figured also wants to kill him. It haunted him again and tries to kidnapped him. It picks up where Issue 2 left off. Howe finally knows who is causing the dreams. Tom walks in and tell him that 10 more people were killed. Howe still thinks about that dark shadow figured man. John Phillips appears and did the row calls. John Phillips gave both Howe and his brother, Tom an hard time. Howe is very loyal to his men. Capt. Andre shows up with some news that Howe already knew about. Andre learns that Tom already knew about the dreams. Howe and Clinton were never friends in the first place. Andre ask Howe if he learn more about the dreams. Howe told him about what happen last night. Howe was hoping to be alone til Corp. John Hampton shows up. Hampton was getting worried about Howe. Then, Howe told him that the ghost was in his mind. Then they meet and greet and they talk about other things. They also talk about Hampton becoming a father soon William is not having any. Hampton left the room and Howe thought he was going to be alone but John Phillips knock on the door. Howe let's him in and John P. wants in on the dreams and pretends to not knowing what John P. is talking about. John P. ask again and William said no. And John P. is trying to force William to tell him about the dreams. Then finally, John P. forces him to tell about the dreams and the unknown dark figure shows up again. Issue 4 picks up where Issue 3 left of with. Howe finally give in. Howe think something up so that John P. won't know the truth. John P. thinks Howe is trying not to tell about the real story. John Phillips has already know about the dreams. John P. is only is giving William an hard time. Howe knew that John P. over heard it and the dark figure reappears. Howe over slept and Tom had to wake him up. Tom ask him if John Phillips kept him up last night. Tom did warn William about John Phillips. Howe told Tom that John P. over heard about the dreams. They kept on talking about what happen last night. William ask him if there is any news yet. Tom told Howe on what Clinton is planning on doing. William went off to find Clinton. William met up with Clinton. William tries to tell him to not send anyone out there tonight. And Howe told Clinton that the horseman is going to kill him. Clinton refuse to listen to him. Howe thinks Clinton was refusing to listen to him. Then the shadow figure returns. And Clinton tells him to stay out of the mission. All the recapped Issues above will be in the ABOUT tab and I will update it again once Issue 5 is fully finish. I've already finish ACT II Issues so far and I'm planning on getting ACT I finish by the end of the year. I've just started ACT III earlier this week. Here is the Most hated characters's List . . .
That's all I have for this newsletter! John Hampton did not know about the dreams til now. He is another character that won't believe in Howe's dreams but in a nicer way unlike Clinton. VOTE! To view the next page! Come back tomorrow for the monthly newsletter! Who is the shadowed figured man next to General Howe in this panel? I was suppose to be on hiatus this week but with DA having some issues last week and only updated page 11 of that week as well. Do you know why General Howe get's stuck on doing the paperwork? Well, he was ordered by Clinton, the "Cold Heartless Fool" as we will be calling him that. General William Howe is far higher rank than Clinton and is 2nd in command after General Gage. Memorial Day is on Monday and there is no page update on that day. The newsletter is on the 31st of May. Come back on Wednesday for the next page update! What do you think of Lt. Bryan Johnson so far? This is the last part for chapter 2 and page updates will resume from this hiatus tomorrow. Salma the Priest Woman buried the salmon bones carefully. It was her religious duty to do so. Salma was a member of the Makah tribe. The Makahs lived along the coast of what is now the state of Washington. The Pacific Ocean and the rivers that run into it made this good country for fishing. Fishing for salmon and halibut was important to the Makahs. It touched upon every aspect of their culture. Culture is the way of life of a people. Salmon became almost sacred to the Indians of the Pacific Northwest. That is why Salma treated the bones of the fish in such a respectful manner. When Europeans first came to America, there were at least 200 different Indian tribes in the territory that would become the United States. Each tribe had its own distinctive culture. Such a culture set each tribe apart from other tribal groups. Some tribes, however,shared certain ways of doing things with other tribes in the same area. This occurred because nearby tribes shared the same environment. Environment means everything in an area--land, water, plants, animals, and climate. These physical surroundings are important to any group. This is especially true of the Indians because they had few means of changing their physical surroundings. The environment of the Makahs favored fishing, so salmon became an important part of their lives. In fact, salmon was the word for "fish" among several of the Indian tribes of the Northwest. In the dry Southwest, of course, fishing played little or no part in the lives of the tribes living there. At the time that Europeans came, most North American Indians knew how to grow a few crops. Maize, squash, and beans were the most common. Nevertheless, crops varied, depending on the climate where a tribe lived. Indians of the Southwest could grow cotton. In the Southeast, tobacco was grown. Indians worked out ways to grow better crops. Eastern Woodland Indians used dead fish as fertilizer when planting maize or beans. The Pueblo Indians and other tribes in the dry Southwest knew how to irrigate their fields. Most Indian tribes stayed in the same place for only a few years. A tribe suffering from unusual weather conditions would move to escape from drought, or too much rain or cold. Also, tribes would have to move if their ways of farming wore out the soil. Occasionally a tribe would lose its crops because of raids by stronger, more aggressive Indians. This might force them to move to a safer place. Since certain Indian tribes often moved, they seldom built permanent homes. An exception is the pueblos, which you read about earlier. Pueblos were built of stone or adobe, which is a brick made of sun-dried earth and straw. Even though most pueblos were abandoned by the time the first Europeans came to America, a few are still used.People have lived in Oraibi, a pueblo in Arizona, for more than 800 years. About 600 people still live there. Oraibi is thought to be the oldest continuously inhabited community in the United States. In the Pacific Northwest, cedar trees were plentiful. So Indians there built their shelters of cedar boards or logs. The cedar was fitted or tied together because the Indians had no metal nails. In the wooded lands of the Northeast and the Great Lakes region, lodges were made from logs, branches, and the bark of trees. Deer hides might have been stretched over cracks to keep out the winter cold. The area bordering the Gulf of Mexico had a hot, humid climate. Therefore, Indians in this region usually built their houses without walls so cooling breezes could enter. Poles supported roofs made of wood, bark, thatch, or reeds. At first, Indians living on the western plains hunted and farmed in much the same way as Indians to the east and south. But their culture changed as buffalo herds increased in numbers. The Indians trailed the herds and cleverly invented ways to bring down the big animals. Sometimes the Indians surrounded a herd and drove it over a cliff. At other times, a hunter wrapped himself in a buffalo skin and crept close enough to the herd to kill one or more animals with a bow and arrows. Following the herds made it necessary to have shelters that were light and easy to carry. To make such shelters the women stitched buffalo hides together. Then they stretched the hides over a framework of poles. This form of dwelling was called a tepee. The women not only provided the basic dwelling but also did the cooking. They prepared rich buffalo meat, using buffalo stomachs as cooking pots. To serve the food, they used ladles and spoons made from buffalo horns. 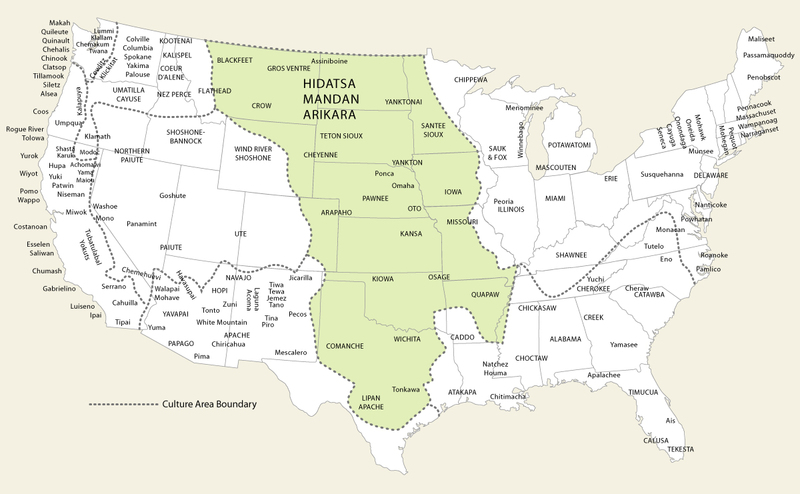 With the arrival of Europeans in America, the buffalo became even more important in the lives of the Plains Indians. The use of horses and guns brought to America by the Europeans made buffalo hunting much easier. In later years the Plains Indians became almost totally dependent on the buffalo for their livelihood. In the eastern region the Indians also practiced farming. They cleared trees to make fields where they raised beans, corn, pumpkins, and squash. They fished in the streams, and those who lived near the ocean gathered shellfish. The Eastern Woodland Indians hunted deer. They ate venison, the meat of the deer. They made the deer hides into clothing and the antlers into arrowpoints. But they never became as dependent on deer as the Plains Indians became on buffalo. Yet, like the Plains Indians, the Eastern Woodland Indians made the best use of the animals and natural resources. The Iroquois lived in what is today the state of New York. The Iroquois were not a single tribe but rather a confederacy. In a confederacy, several groups join in a loose union to act together for certain purposes. The Cayuga, Mohawk, Oneida, Onondaga, and Seneca tribes were members of the confederacy. At the beginning the main purpose of the Iroquois Confederacy was to stop warfare among the five tribes, or the Five Nations as they called themselves. In the tribes of the Iroquois Confederacy, women occupied a unique position. Like women in other tribes, they cultivated the crops, prepared food, made clothing, and took care of the children. In addition, Iroquois women chose the 50 sachems, or chiefs, who met as a council each year to discuss matters of common concern. The Senecas sent 8 representatives; the Cayugas, 10; the Onondagas, 14; and the Mohawk and Oneidas, 9 each to this council. Each tribe voted as a unit, and each had its own special tasks within the confederacy. The two war chiefs were always Senecas. The meeting place for the council was in the territory of the Onondagas. They had charge of the central council fires and always kept them burning. Each tribe was made up of several families, or groups of families. Each village had a governing council. The women chose the members of this council, just as they chose the 50 sachems of the confederacy council. The members of all the councils were men, though. Iroquois families lived in villages of from 10 to 50 families, numbering 50 to 250 people. A palisade, or fence of sharpened logs, enclosed the village. Outside the palisade lay the fields where the women cultivated and tended rows or corn, squash, and pumpkins. Indians in the Americas had made different kinds of adjustments before the arrival of the Europeans. Some tribes had risen to more advanced levels of civilization. Others had remained at lower levels. Except for the Mayas and the Aztecs, the tribes in early America did not develop a written language. What they knew was passed on by word of mouth. The wheel was not known to the Native Americans. Nor was the secret of exploding gunpowder. Thus, Indians had no guns. Except for the Incas, Indians lacked large animals for transportation or use as beasts of burden. In the Andes, the Incas had trained wild llamas. These animals were probably descendants of prehistoric camels. Like the small horses that once roamed the plains of North America, the camels had become extinct. But llamas were much less useful than the horses, oxen, and mules brought to America by the Europeans. Still, the Indians had the knowledge and skills that enabled them to survive in the Americas. Outsiders coming to these continents at first had to learn from the Indians. American Indians had great respect for nature. Their religions differed from tribe to tribe, from culture to culture. But all the religions showed in many ways the Indians' respect for the natural wonders they saw about them. American Indians had a long history in what came to be called the New World. Of course, to the Indians it was really a very old world. They had developed complex civilizations that had adapted to various environments in the Americas. Some of these civilizations, to be sure, had declined or vanished entirely. But so had other civilizations elsewhere. In Europe a new kind of civilization had developed by the fifteenth century. It was a rising civilization, ready to expand its influence. This Western civilization, as it has been called, put a high value on technology. Technology is the amount of scientific knowledge and the kinds of tools a people have. Some of this technology had been borrowed from cultures in Africa and Asia. Some had been invented or improved upon by the Europeans. Whatever the sources, Western technology was more advanced than that of the Indian cultures of the Americas. In any conflict between the Indians and the European settlers, the Europeans' technology would give them a big advantage. In basic values, however, American Indian civilizations were at least an even match for Western civilization. Indeed, today there are many parts of the Americas showing a blend of Western and Indian civilizations. Thousands of names for cities, states, lakes, mountains, and rivers throughout the Americas are taken from Indian languages. Half the states in our nation have Indian names. Americans daily use such Indian words as squash, tobacco, chipmunk, skunk, moose, pecan, woodchuck, and toboggan. Phrases such as "walking Indian file" and "enjoying Indian summer" are frequently heard. In spite of Western civilization's superior technology, the first European explorers and colonists had to learn from the Indians. Indians taught them how to plant, fish, and hunt in the Americas. Indian medicine men and women often were called on to doctor pioneer colonists when no other physicians were available. The Indians' knowledge of herbs and plants as medicines proved enormously useful to grateful pioneers. Today we are still making use of Indian knowledge and skills. Indian jewelry designs are popular. Boy Scouts and Girl Scouts learn Indian woodcraft. Today's conservation movements owe much to Indian ideas of the relationship between human beings and nature. Books, movies, and television make use of Indian themes. Unfortunately, the way Indian history, culture, and characters are portrayed is often inaccurate. Sometimes it seems as if Western civilization overwhelmed the Indians. Actually, there is evidence all around us to show that the civilization of the Native Americans has had a lasting influence. Physical evidence indicates that the first Americans probably came from Asia by crossing a land bridge thousands of years ago. Carbon dating has proved to be the best method of finding out when ancient peoples were living in the Americas. Agriculture enabled the Indians to develop civilizations because they no longer had to search for food. The Mayas, the Aztecs, the Incas, the Pueblo Indians, and the Mound Builders were among the more advanced Indian civilizations to develop in the Americas. Very little is known about the Mound Builders' civilization and disappearance because they left no written records. A tribe's environment affected it life-style, type of dwelling, and diet. It also affected its cultural development. Stay tune tomorrow for Page 11 update! Read to learn more about the mysterious mounds! . . .
Aru the Strong carried the heavy earth-filled basket to the top of the ramp. After emptying the basket, he trod on the soil with his bare feet, making it solid. Aru did the same thing many times each day. He did it day after day, year after year. Was he a slave captured from a neighboring tribe? Was he a paid worker? Or did he carry the baskets as part of his religious duties? No one knows exactly why Aru did this work. And yet we know what he was doing. He was helping to build a large earthen mound. 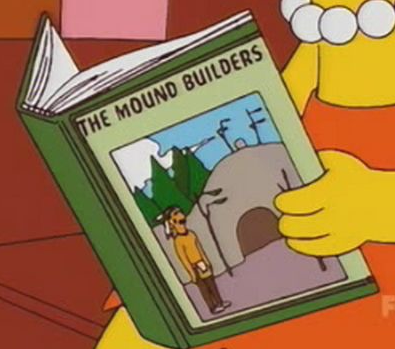 The Mound Builders from The Simpsons. The civilizations of the Mayas, the Incas, and the Aztecs flourished in areas south of what is now the United States. Still, within the area of the present-day United States, there were thriving native civilizations. You have already learned about the Pueblo Indians. Hundreds of miles to the east lived the Mound Builders. This civilization developed in stages. Each stage was more advanced than the one before it. Some Europeans saw at first hand the glories of the Aztec civilization. The high level of Incan civilization is also a matter of historical record. However, no European ever saw the Mounds Builders at the high point of their civilization. And they left no written records. They left only mounds such as Aru the Strong helped to build. When settlers moved into the river valleys of the United States in the eighteenth and nineteenth centuries, they saw in many of the valleys strange mounds of earth. Farmers and others who were puzzled by these piles of earth dug into them. One person who wondered about the mounds and the people who built them was Thomas Jefferson, later our third President. He excavated, or dug into, a mound on his Virginia farm. Unlike Jefferson, most diggers were interested only in collecting artifacts from the mounds. Artifacts are objects that people have made. Among these objects are necklaces, tools, and pottery. Only a few of the diggers wondered why the mounds were built. But as time went on, the mysterious mounds attracted the attention of scholars. This aerial view shows the Great Serpent Mound in Ohio. In 1890 a group of scholars working for the Smithsonian Institution published a report on the mounds. The Smithsonian Institution, in Washington, D.C., is widely known for the scientific research it carries on. Its report on mounds was based on 10 years of study. The report described vast numbers of mounds in an area extending from Ontario, Canada, southward to the Gulf Coast of Florida, Mississippi, and Louisiana. The mounds are especially numerous in the Ohio and Mississippi river valleys. In the states of Illinois and Ohio, thousands of mounds have been counted. These mounds, built by several groups over hundreds of years, are of different types. The type found most often is the small round burial mound. These mounds nearly always contain skeletons and objects buried with them. Another common typed is called the temple mound. It is flat on top but sometimes has terraced sides. This kind of mound was used as a foundation for a wooden building or temple. Criel Mound part of the burial mounds. There are several other types of mounds besides the two main ones. Geometric mounds were built in the form of circles, squares, or parallel lines. Sometimes these geometric mounds enclose an area of 100 acres or more. The effigy mounds are especially interesting. An effigy mound is built in the shape of a bird, snake, animal, or human beings. The state of Wisconsin has many effigy mounds, and some can be seen in Indiana, Ohio, and other states. The Great Serpent Mound in southern Ohio and the Opossum Mound in Tennessee are famous effigy mounds. Effigy Mounds National Monument is located in eastern Iowa. The Mound Builders worked with a purpose. They had a reason for building each mound. Some experts believe that the custom of mound building came from the south, as did agriculture. There is some resemblance between the earthen temple mounds and the pyramids of the Mayas and Aztecs. Tribes were building mounds at different times in different places. The years A.D. 1 to 1000 were a time of great building activity. Artifacts found in some of the mounds of those years showed that a lively trade took place among well-to-do tribes of Mound Builders. Among the materials and objects found in the mounds are copper from the Lake Superior region, shells from both the Atlantic and Gulf of Mexico coasts, and grizzly bear teeth from the area of the Rocky Mountains. Perhaps the most remarkable work of the Mound Builders stands today near Collinsville, Illinois, about 15 miles east of St. Louis. Its name is Cahokia Mounds State Historic Site. It could just as well be called Cahokia City. The site includes a great number of different mounds. They were built by a skilled Indian civilization that disappeared about 500 years ago. Cahokia Mounds is known as the only prehistoric Indian city north of Mexico. At its height it had a population of up to 40,000 people. Probably 30,000 more Mound Builders lived in villages nearby. 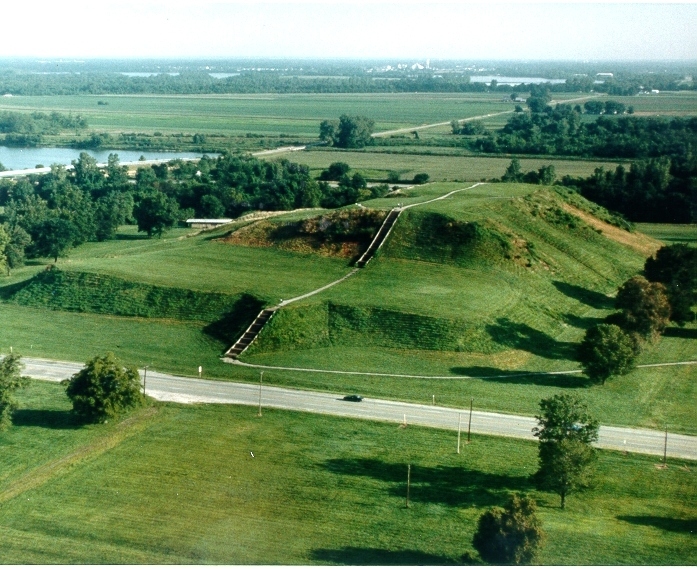 At Cahokia Mounds the main mound is a flat-topped pyramid 1,080 feet long, 710 feet wide, and 100 feet high. It covers 14 acres. It is believed to have held a massive wooden building, used for religious purposes. It is known today as Monks Mound. Nearly 100 burial mounds surround Monks Mound. At the center of this old cemetery is the grave of a prominent ruler. Buried with him were attendants meant to serve him in the next world. Around the site of the Cahokia Mounds are the traces of a stockade that required 50,000 logs. 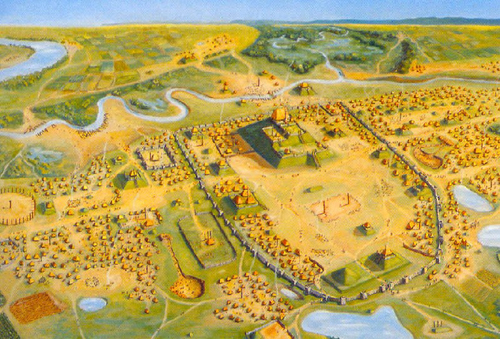 Imagine the length of time and the many baskets of earth it took to build the Cahokia Mounds! Mound Builders knew nothing about wheels, so they worked without wagons or wheelbarrows. They had no animals to haul earth from many miles away. All they had was the labor of thousands of persons like Aru the Strong. Why did the custom of mound building die out? What happened to the highly organized tribes of Mound Builders? No one knows for certain. Perhaps they suffered the fate of other great civilizations of the past. Savage, warlike people have time and again invaded the lands of more civilized people and have overthrown them. This may have been what happened to the Mound Builders. In the nineteenth century, Cyrus Moore made a fortune in the cotton business. Having plenty of money, he was able to pursue his hobby of collecting Mound Builder treasures. Each winter Cyrus Moore had a houseboat built to order in either St. Louis or Cincinnati. Each spring he moved aboard his new boat with a crew of strong-armed diggers. In summer, Moore's houseboat was towed or floated along the banks of the Mississippi and its many tributaries. There were thousands of mounds near these rivers. Moore's diggers had plenty of sites for their busy shovels. The pottery, tools, ornaments, and other objects they found--like the mica hand--were cleaned and brought aboard the houseboat. While the diggers worked, Cyrus Moore sat on deck in a special chair, playing his banjo. He always played a lively tune when his men found something special. Each fall the summer's collection was unloaded at New Orleans. Then the houseboat was sold. The next spring Moore and his crew went north to take over another new houseboat. Then they repeated the process of the previous summer. In this way Cyrus Moore built up a great collection. It was the envy of other collectors. Oddly enough, Moore displayed little curiosity about the Mound Builders or what had happened to them. He was mostly interested in collecting objects buried in their mounds. He was also interested in sitting on the deck of his houseboat and playing his banjo. Stay tune for the last part of Chapter 2 tomorrow! Sleepy Hollow is still on hiatus but the updates will resume on Friday. It has been a goofy week for Sleepy Hollow. Leel the Clever One was the first to notice. First, you put seeds from plants into holes in the ground. Then, when spring came, plants like the ones the seeds came from grew from the earth. It was a great discovery because it allowed people to settle in one place. On this discovery was based the rise of civilization in the Americas. The Ice Age had ended. Animals of the late Ice Age had become extinct. Early Americans had lived by killing these animals and eating their flesh. Human beings in the Americas might have become extinct, too, had it not been for an important fact. Human beings are omnivorous--that is, they can eat plants as well as meat. They do not have to depend on meat alone. In the centuries following the end of the Ice Age, prehistoric Americans turned more and more to plants for food. Even during the Ice Age, hunters had probably learned that many roots, berries, and nuts were good to eat. As the large animals vanished, tribes continued to move about. Their members lived by gathering these wild foods and by eating the flesh of such small animals as they were able to trap and kill. This was probably the time that Leel--or someone like her--began the practice of agriculture. Agriculture is the planting of seeds and the care of growing plants. It also involves saving the very best of the plant seeds to improve the next year's crop. It is believed that agriculture was first practiced in Asia and Africa. Leel and her tribe may have brought this practice to the Americas and then taught it to others. Or clever people may have started practicing agriculture in the Americas on their own. Where and when agriculture began in the Americas have been matters for debate. Most scholars now believe, however, that agriculture was first practiced in the Andes Mountains of South America. Crops were grown there at least 4,000 years ago. Some of the crops that these people grew were potatoes, peanuts, kidney beans, and tomatoes. Although the earliest movement of people in the Americas was almost certainly from north to south, evidence shows that the practice of agriculture advanced from south to north. In the places where agriculture had been practiced the longest, the greatest civilizations arose. The Mayas developed the first advanced civilization in the Americas. They lived in the jungles of Central America and southern Mexico. Their civilization flourished from 1,200 to 700 years before Europeans arrived in America. The Mayas built large cities, supported by croplands carved from the jungle. One of their main crops was maize, or Indian corn. From this area, the cultivation of maize spread throughout North America and South America. About the year 900 the Mayan civilization declined for unknown reasons. But reminders of its greatness can still be seen in the jungles. There are ruins of temples, pyramids, and other stone buildings. By the 1400s the Aztecs ruled what is now central Mexico. Like the Mayas, the Aztecs built beautiful cities. Their capital, Tenochtitlan, was built on islands in the middle of Lake Texcoco. It stood on the site of today's Mexico City. Tenochtitlan had a population of about 300,000. The surrounding farmlands produced abundant food supplies. The Aztecs developed an accurate calendar with 365 days. They wrote their history in a series of pictographs on long strips of paper. They learned to fashion jewelry with jade, gold, and silver. The Aztecs were a warlike people. They practiced human sacrifice because they believed that their gods needed blood in order to live. As a result, other tribes lived in dread of the Aztecs. The Incas were the descendants of those first Andean tribes who learned to farm long ago. By conquering their neighbors, they greatly expanded the region they controlled. In the 1400s, they ruled over all the tribes in the areas of present-day Peru and Ecuador and parts of Chile, Bolivia, and Argentina. Cuzco in Peru was their capital. The Incas developed a complex system of farming. On the steep sides of the Andes, the Incas cut terraces, or ledges, into the land for planting. Water from mountain streams irrigated, or supplied water to, the dry soil. By using these methods, the Incas were able to raise more crops to feed the many people they ruled. To transport these crops and other goods, the Incas built an extensive highway and bridge network. There were more than 7,000 miles of roads. Messages or communications were carried across their lands by relay runners. About 700 years ago, Indian civilization in the Southwest United States reached its height. Agriculture had probably come to this region 2,000 years earlier. Still, it took centuries for farming to develop enough to support a large population. Much of this population lived in pueblos--the Spanish word for "towns." Indian pueblos were, however, more like apartment houses than towns. At one time there were thousands of pueblos. They were scattered over the region between the Mexican state of Chihuahua in the south to Kansas and Colorado in the north. One of the most famous is Pueblo Bonito in Chaco Canyon, New Mexico. About 1,000 years ago Pueblo Bonito housed at least 1,500 people. Until a bigger apartment house was built in New York in 1882, Pueblo Bonito and some of the other pueblos were the largest dwellings ever built in the Americas. To support so many people, Pueblo agriculture had to be well developed. Farmers raised corn, squash, and beans. They looked upon these vegetables as gifts from the gods they worshiped. Like farmers to the south, the Pueblo Indians irrigated their crops with water brought from distant streams. They raised cotton, too. From its fibers, cloth was woven and decorated with a variety of fancy designs. At Mesa Verde, in southwestern Colorado, pueblos were built along the sides of steep cliffs. Some of these dwellings were several stories high. They were probably built along the sides of cliffs as a means of protection from the tribe's enemies. Most pueblos in the Southwest were abandoned long before Europeans came to America. Invaders from the north may have driven the peaceful Pueblo Indians from their towns. Or changes in climate may have caused a drought, that is, a long period of dry weather. A lengthy drought would have been a disaster for farming. People would have had to leave the pueblos to find other sources of food. As people scattered in search of food, the Pueblo civilization would have declined. I know that with Sleepy Hollow on an early hiatus and with DA having issues since last night. I will share Part One of Chapter 2 this week. Fear of enemies behind them drove Omuk the Leader and his small band along. Out of the fog these enemies had come 2 days earlier. They were men and women dressed in furs, looking much like the people Omuk led. There were at least 100 of these enemies. But Omuk's band had no more than 20 fit fighters. Omuk and his people had fled. The enemies had not followed for long. But they had taken over the good hunting grounds that Omuk and his followers had enjoyed. Now Omuk must find food for his people, or else they all would die. The flight had led the band away from familiar landmarks. Now Omuk the Leader was lost. He kept the open water to the side of him as he moved on. Always he moved in the direction of the rising sun. Omuk and his band may have been the first people to enter America. We do not know that there was really a man named Omuk. But we do know there were people like Omuk in prehistoric times--that is, in those early years before there were written records. Archaeologists say that the flight of this prehistoric band of people might well have taken place. Archaeologists study objects, ruins, and other evidence of human life in the past. Omuk the Leader and others like him lived at a time known as the Ice Age. Huge sheets of ice called glaciers had pushed down from the north to cover much of North America. Beneath the ice a narrow strip of land connected Siberia, in Asia, and Alaska, in North America. As the Ice Age ended, the glaciers melted. In time, the water from the melting ice covered the land bridge. Today the land that Omuk and his band walked on is covered by the waters of the Bering Strait, which separates Siberia and Alaska. Most scholars today accept the idea that the first people in America came across the land bridge from Asia. But there are other ideas advanced by some. Some people believe that these first people in America were descendants of the ten lost tribes of Israel. Others believe that America's earliest inhabitants were related to ancient Egyptians or Greeks or perhaps to the Phoenicians or Romans. Some think that the first Americans crossed the Atlantic by way of a lost continent called Atlantis. It may be, some have said, that the ancestors of the American Indians were from Wales or Ireland and were blown in their boats to North American by an Atlantic storm. Still others think that the first Americans crossed the Pacific Ocean by boat or raft from China, Japan, or the islands of Polynesia. There is indeed some physical evidence that they did come from an Asian land, whether by boat, by raft, or by the land bridge. The American Indians are of the Mongoloid race. so are the people of China. The American Indians and the people of China. The American Indians and the people of China differ in many ways. Yet in some ways they are much alike. Most Indians have a fold of skin along the inner edge of their eyes. So do Asiatic people of the Mongoloid race. This fold probably developed over thousands of years, passed along from generation to generation. Such a physical characteristic would help the people having it to survive the harsh climate. Certainly it would have helped Omuk as he narrowed his eyes to peer into the fog and snow along the Ice Age bridge. Babies of the first Americans probably had a bluish-black spot on the lower back. Many American Indian babies are born with this spot. The spot tends to disappear when they grow older. The same thing happens to the spot that marks most of the children of eastern Asia. The mark is called the Mongoloid spot. American Indians vary in appearance. However, many have straight black hair on their heads but little hair on the rest of their bodies. Many have dark brown eyes and reddish or brownish-red skin. These are physical characteristics of the Mongoloid race. Indian and Chinese babies often resemble each other. This may be one more indication that the ancestors of the American Indians came from Asia. Omuk and his Ice Age descendants lived by hunting. They hunted animals that are now extinct--that is, they hunted kinds of animals that have died out. Among them were ancient bison and huge elephant like animals called mammoths. No doubt the live of these first Americans were harsh and short. Still the number of people increased. The first group to come across the land bridge was followed by others. However, the main increase in population came from the children born in the new land. Though many died young, enough lived to populate hundreds of places. Omuk's people and their descendants roamed from place to place, depending on the climate and food supply. Slowly they spread eastward and southward into the Yukon River valley, away from the coast. They moved southward from Alaska into western Canada. Finally they reached lands that glaciers had left uncovered. As time passed, some small bands joined together and formed larger groups called tribes. By the time the Ice Age ended, these early Americans had reached at least as far as present-day New Mexico. How do we know this? We know it partly through a find made by a black cowhand on a ranch in northeastern New Mexico. His name was George McJunkin. One day in the spring of 1926, George McJunkin was following the trail of some missing cows. The trail led him along the edge of Dead Horse Gulch. McJunkin saw some bones sticking out of the mud on the side of the gulch. Being a curious person, he got off his horse to take a closer look at the bones. The bones were about the size of cow bones and buried 20 feet below the surface. This seemed strange to McJunkin. Even stranger was the flint spearhead he pried from a bone with his cattle knife. It had a groove, or channel, or each side and was different from any other spearhead that George McJunkin had ever seen. Why, he asked himself, were the animal bones and the flint spearhead buried so deep? This also seemed strange to the people whom McJunkin told of his discovery. As the news spread, and expert on animal bones came to have a look. He found that the bones belonged to a kind of bison that had lived in North America during the last years of the Ice Age. The spearhead proved that human beings were living in New Mexico thousands of years ago. Bones of other ancient bison were dug up at the site of McJunkin's discovery. Several more flint spearheads were found. These discoveries were all made near the town of Folsom, so whoever made the spearhead and killed the bison came to be known as the Folsom man. No human bones were found at the site of McJunkin's discovery. Scholars guessed that the bison bones might have come from a single hunt. Perhaps a herd of the ancient bison drank from a pool or lake that no longer exists. The Folsom people might have surprised the bison, killing them on the spot. They might then have cut up the dead animals and carried the meat back to their campsite. This would explain the absence of human bones near the bison bones. How long have people been in America? Geologists are scientists who learn about the earth and its history mostly through the study of rocks. They are able to tell much about the Ice Age but nothing that helps a great deal in dating the time that Omuk and his people crossed the land bridge from Asia. Nor are they able to give more than a very rough estimate of the time when the Folsom people lived. Counting tree rings on the ends of logs or the stumps of trees is one way of time dating. Each tree ring shows a year's growth. Another method is counting the layers of soil or gravel laid down at the bottom of what was once a glacial lake. The most accurate method of time dating, however, makes use of what scientists have discovered about living matter and radioactivity. Radioactivity is caused when atoms change and give off energy. Scientists have discovered that all living things things have a radioactive substance called carbon 14. In living matter the amount of carbon 14 is always the same. But when a living thing dies, the carbon 14 in it decreases at a fixed rate. Think of a kettle of water boiling dry as the water evaporates (I have done it before). This is much like the way once-living matter gives off radiation. It is known that a pound of carbon 14 will be reduced by radioactivity to half a pound in 5,568 years. In another 5,568 years it will weight only a quarter of a pound. Even then it will continue to throw off radiation. Delicate instruments can measure the amount of carbon 14 in anything that has been alive. By carbon dating we know that the bison at Dead Horse Gulch died about 10,000 years ago. In Sandia Cave, near Albuquerque, New Mexico, hunters left the bones of ancient camels, mastodons, and small horses. All these animals have long been extinct. But by using carbon 14 dating, we find that hunters killed the camels, mastodons, and small horses about 25,000 years ago. No one has ever found conclusive evidence of the date when the first people crossed the Ice Age land bridge from Asia. Probably no one ever will. Nevertheless, that crossing must have been made more than 25,000 years ago according to the evidence found in Sandia Cave. Other finds have pushed the date back even further. For example, mammoth bones found on Santa Rosa Island, off the coast of California, date back about 30,000 years. The southward journey of the Ice Age people did not stop in New mexico or California. They pushed on into Mexico and South America. In fact, there is proof that humans lived in Fell's Cave, near the southern tip of South America, from 8,000 to 10,000 years ago. If prehistoric people had spread so far across the American continents by that time, their date of entry must have been very early indeed. Thank you all for reading Part One of Chapter 2 and hopefully the hiatus won't last for two weeks and I will have to cut the hiatus short now and the page update will resume on Friday of this week no page update on Monday because of Memorial Day and the update will resume next Wednesday. Well, it looks that I'm going on an hiatus this week instead of next week but I'm still going to be on hiatus next week til the 31st, which is the newsletter, which I'm glad that I can update that. I know that DA is having some issues that I can't even upload the page not even right now and that is why I'm going on hiatus til they get the thing fix. There will be no page update til noon! I just can't the page to load on the DA site and their having some problems with it. Hopefully, they will get it fix soon and we all are waiting to see Page 11 but it still be a late update once I get up out of bed to work on it. Don't worry, the page will be up like around afternoon! Yet again, John have lost his mind like always. Here is the "Question of The Week"! What character do you hate the most? . . .
Bryan Johnson is a very close friends with Tom Phillips and he sure is shy sometimes, even around John Phillips. No more new faces for the rest of ACT I! We will miss you, John! This is the final appearance of Capt. John Andre til ACT IV. He was captured by the American Rebels as we all learn about his where bouts since we last seen him, it was in Issue #3. Even our British General William Howe had tears in his eyes. Bryan will make his first appearance on Wednesday. If you did have voted for my comic, you've seen what's it's like, a title page . . . For BOOK ONE, the title page looks more like a cover for BOOK ONE. Yes, there is a BOOK ONE and it will include ACTs #1 - #4. And there is three BOOKS and I know it's too early to release the BOOK cover. BOOKS TWO & THREE won't be as long as BOOK ONE and we are only in ACT I and we are still on the 6th Issue. Here is a little some you'll enjoy! Have you guys seen Liberty's Kids? Well, I'm going to post them in the Media tab but I'll release the episodes one by one, just like what I do with the new pages here. And there is only 40 episodes so enjoy them and you can re-watch them over and over again. 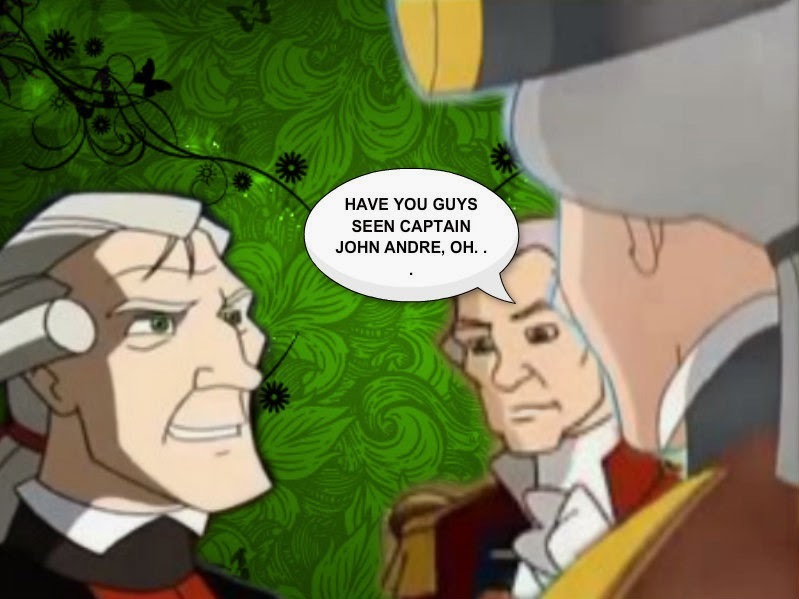 Episode #1: "The Boston Tea Party"
Remember, the Question of The Week is every Friday unless if the comic is on hiatus. I will no longer be putting the "Future Updates" on the posts anymore. John Andre's last appearances is Page #8 but he will still appear in ACT IV. Bryan Johnson will be joining us next week! Here is the Question of The Week! Who is your Favorite Character of Sleepy Hollow? All you need is one answer or one favorite character . . .
John Phillips is surely giving General Howe a very hard time. VOTE to view the next page! Bryan Johnson will appear in Page #9 soon! Return on Friday to find out why we haven't seen John Andre since Issue #3! There will be Question of the Week this Friday and this one will be an easy one. It will ask you what your favorite character is and you only have to answer one favorite character is. Way it looks for General Howe is trying to find a way out and come to Clinton's rescue before the Headless Horseman get's him. But, the only person that stands in Howe's way is John Phillips, Tom's older and only brother. VOTE! to view the sneak-peak of the next page! Bryan Johnson will make his first appearances on May 14th for Page 9. John Andre will not be with us for the rest of ACT I and he won't be in ACT II. But he will return in later Acts. There have been change of plan! I'm skipping the part two and I will go to part three but will be mark as Part Two and its the last part of Chapter 1 Tools for Studying History. This is the last part of Chapter 1! Enjoy! Perhaps most of you have at least studied parts of United States history in school before. You might well ask, "Why study it again?" There are good reasons. One excellent reason is that you are older than you were when, in a lower grade, you last learned about the history of our country. We can compare your life to climbing a mountain. As you grow older, you reach a higher place than you occupied 3 or 4 years ago. Having now reached a higher level, you can see more than you could before. Things you were unable to understand several years ago will now seem clearer to you. Furthermore, good citizenship in our complex world requires almost constant study and thought. The great American patriot Patrick Henry once said: "I know of no way of judging the future but by the past." Learning about United States history will make you a more alert and effective citizen. No one studying United States history can learn all there is to know about it. Men and women who devote a lifetime to studying United States history still confess they have an incomplete knowledge of our past. Since no one can learn everything, teachers in the earlier grades had to choose those things they thought you could learn best at that time. But you are not about to study them once more. You are continuing your study at a higher level. As you continue your study, you will be practicing and improving learning skills that are immensely important to your future success. Maps, tables, and graphs are guides to learning. Already you have learned about maps. They will help you learn about the history of your country and it will help with the comic Sleepy Hollow as well, too. A caption is a description or explanation of the meaning of an illustration. Another visual that can help you learn is a time line. Time lines can help you understand the order in which historical events occurred. Many Americans find a hobby in some aspect of the past. For them there is a fun factor in the study of history. Perhaps they restore antique automobiles, dresses that I posted last year, or collect old stamps and coins. Perhaps they like to read good historical novels or biographies of famous people. They may concern themselves with the history of the state or community in which they live, or do research into the history of their own families. Perhaps they travel to historic places. Practically every community has places of historic interest. What historic places are there in your community? As you study United States history, you will read about what happened at many of the places where it took place at. Have you visited any of these historic places? Have you visited other historic places? Doesn't a visit to a historic place mean more if you know what took place there? There is history all around you. History is in the streets where you walk. It is in the place where you live. It is in your family, and in your place of worship, and in your school. In fact, there is a history to everything you see or read or touch. Keep this in mind in your study of United States history. Maps help us to learn because they can show large areas in a small space. Maps can show many kinds of facts, such as information about landforms, boundaries, cities and towns, rivers, highways, precipitation, and climate. Maps can show us not only how things are now but also how they were in the past or the future. Tables and graphs are effective tools for presenting information in a small space. Learning about United States history will make you a more alert and effective citizen. Some features in this book that will help you are tables, graphs, maps, table of contents, captions, time lines, historical documents, annotations, vocabulary, checkup, skills, chapter reviews, special interest features, Biographical Dictionary, Glossary, Atlas, and Index. Page updates will resume on Monday, May 5th! Hopefully the wait will be over on Sunday night. The Dreamer is finally available for your E-Readers! Each complete graphic novel is only $9.99 in digital format! Here are some info you may enjoy and some history as well, too. Enjoy! There was deafening handclapping and cheering as the bird gracefully lifted itself into the sky, its rocket belching from the lower end, soared through a few thin clouds, began a vapor trail,then disappeared into space history. . . . This was a historic day. Yet it was only a new chapter in the continuing history of our country. The first people chosen as astronauts, or people who travel in space, became as close as the members of a large family. They trained together and ate, slept, and lived under the same roof. Three of them died together in an accident at Cape Canaveral on the east coast of Florida in January 1967. The seven-member crew of the space shuttle Challenger died in an explosion shortly after takeoff in January 1986. The brave crew members had risked their lives to explore the unknown. John H. Glenn, later a senator from Ohio, was the first to orbit, or circle, the earth. His successful three-orbit flight took place on February 20, 1962. Other astronauts have reached heights equal to or greater than Glenn's. A dozen have had the thrill of walking on the moon. The first astronaut to set foot on the moon was Neil Armstrong in 1969. From the moon, astronauts have an unusual experience. In one glance they can see the whole United States or Asia. Only a few of us will ever see the whole United States as space travelers can now see it. However, we can see our whole country in other ways. 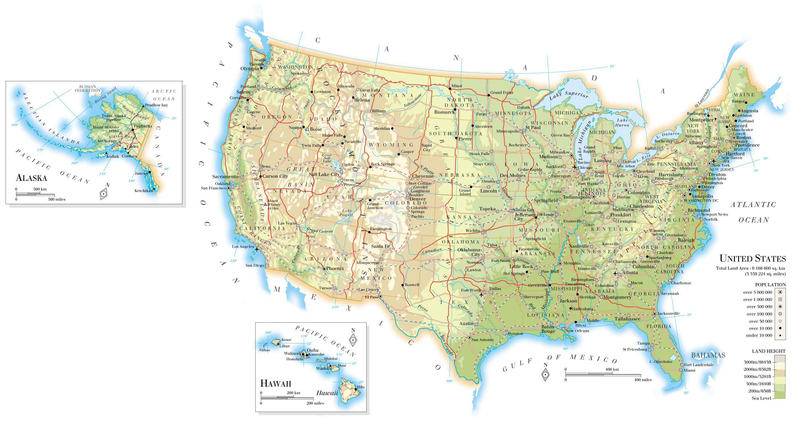 Maps can show the entire United States. Indeed, maps can show aspects of the country that are invisible from space. As space travelers speed through space above the United States, they can perhaps make out certain land-forms, such as mountain ranges. Whether they can or cannot, you can see them by looking the relief map. A relief map shows the elevation, or height, of the earth's surface. The elevation of land is expressed in feet or meters above or below sea level. Elevation is often shown by contour lines. All points along a contour line are exactly the same distance above or below the level of the sea. Sometimes color is added between contour lines as on the relief map to show different elevations more clearly. Among the mountain ranges shown on the relief map are the Appalachians and the Rockies. Which ocean is the Appalachian range closer to? The Rocky Mountains makes up the largest range in the United States. Between the Appalachians and the Rockies, there are plains and plateaus. West of the Rockies are three other mountain ranges. What are their names? Mountain ranges have been important in United States history. They were barriers, or walls, that slowed for a time the movement of the American people. Nevertheless, as you will learn, these barriers were overcome as the United States spread across the continent. No space traveler can see the boundaries dividing our country into 50 states. But you can, by looking at the map. It is a political map. A political map shows such things as national and state boundaries and the names and locations of towns and cities. Find your state on the map. Does it share a common boundary with other states? If so, which ones? Can you find states on the political map that do not touch any of the other states? That touch only one other state? How many foreign countries share a common boundary with the United States? Some states have no water boundary between two states. The political map shows the capital city of each state. Could space travelers pick out your state's capital city as they orbit the earth? Probably not. But you can tell the name of the capital city of each state by looking at the map. How many states have capital cities named for United States Presidents? You can also find the location of each capital city on the political map. You do this by using lines of latitude and longitude. Lines of latitude circle the earth in an east-west direction. They are numbered north and south of the Equator. Lines of longitude run north-south between the two poles. The lines are numbered east and west of the Prime Meridian. What are the latitude and longitude coordinates for Memphis, Tennessee? What city is located near 33* N, 97* W? What are the coordinates for your state capital? 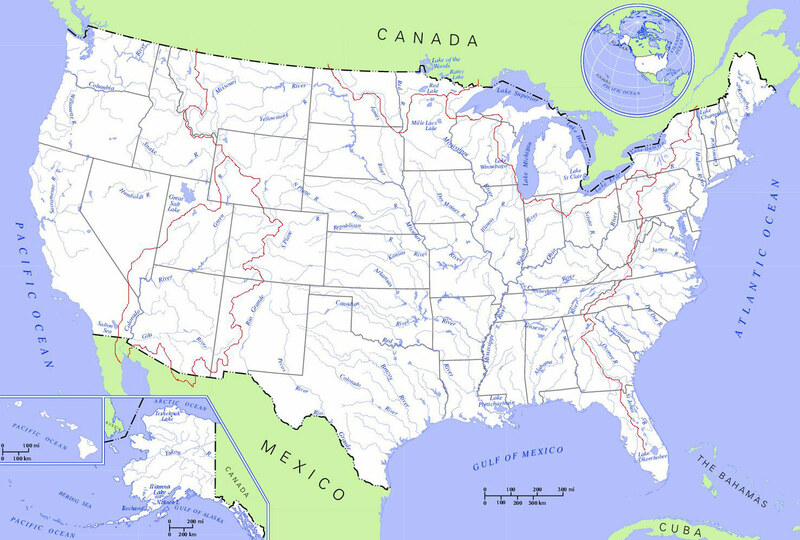 The map above shows the largest rivers and lakes in the United States. As you can see, the Mississippi River and its tributaries, rivers that run into the Mississippi stand out as features of the land. During the entire span of human life in North America, the Mississippi River system has provided food and transportation for the people of the region. In the northeastern section of the United States are the Great Lakes. Can you find the names of these five lakes on the map above. Which is the only one entirely within the United States? Rivers and lakes provided a natural system of transportation in our land for thousands of years. But nineteenth-century Americans added to this natural system by building canals and railroads. In the twentieth century, Americans added an extensive highway system. 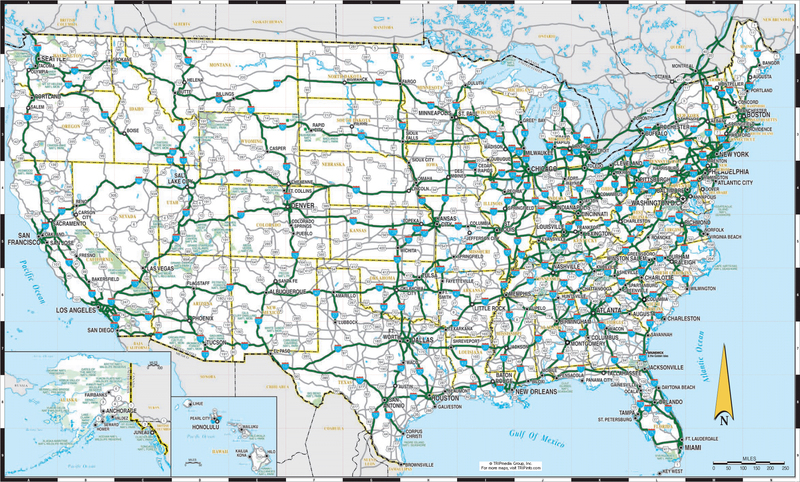 The map above shows our Interstate Highway System. Interstate highways are identified by route markers that look like red, white, and blue shields. The even-numbered interstates, such as 40, 70, and 80, run east and west.Those with odd numbers, such as 5, 25, and 95, are north-south routes. Find these routes on the map above. The first interstates were begun in 1956. Today the system is 95% complete. At times of gasoline shortages some Americans have criticized the Interstate Highway System. These critics say it is not wise to spend large sums of money on a system that encourages travel by private automobile. It would be better, they say, to spend the money on mass transit. Mass transit is the carrying of people by buses, trains, and subways. How do you think the money should be spent for interstate highways or for mass transit? No doubt you have been on interstate highways. Which ones have you traveled on? Which interstate is nearest to your community? Though you may have ridden on the interstates, have you ever had a train ride? Or a ride on a canal boat? Any nation as large as the United States has a great variety of climates. Maps can demonstrates this variety. For example, the map above shows the average annual number of hours of sunshine in the United States. You can see how the amount of sunshine differs from one part of the country to another. The amount of sunshine a region receives affects its climate. Which regions of the United States have the most sunshine? which have the least? On the map above, note the area of very low annual precipitation, that is, moisture falling to earth as rain, snow, hail, sleet, or mist. For many years in the nineteenth century, this area in the West was labeled on maps The Great American Desert. It was thought to be almost unfit for human settlement. And yet today this area supports millions of people. What changes, do you think, took place so that people could live there? People who make maps are known as cartographers. They make a useful product. The maps will help to teach you how the United States began, how it grew, and how it got to be the nation it is today. Maps are a part of our lives. There are many other uses of maps. Drivers taking long-distance trips depend on road maps. There are state maps, city maps, maps of fairgrounds, maps of the world, and even maps of our universe. The seating plan of a theater, a baseball park, or a football stadium is a kind of map. A collection of maps is called an atlas. Stay tune for Chapter 1 Tools for Study History: Using Tables and Graphs tomorrow!